Super excited about this post! When I first heard about ModCloth, it was on Gabifresh– my favourite plus size fashion blogger EVER. Her style is super amazing! ModCloth offers unique clothing, shoes and accessories with a vintage/indie/retro touch that allows it’s customers to have fun with fashion while making a statement and being one of a kind. Last week, I received an email from a lovely stylist at ModCloth who asked me to be part of their Uniquely You campaign. It basically involved creating a style storyboard centred around an item from their site through Polyvore and making a blog post about it along with other select fashion bloggers. The winning look is to be posted on the ModCloth Polyvore page with a link back to the blogger’s page. Fingers crossed! I was asked to create a look centred on one of their favourite pieces available in a variety of sizes – the Vivacious and Vibrant Dress in Noir. 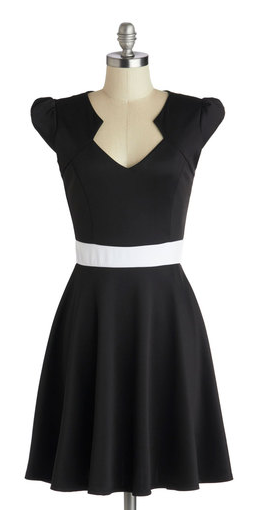 When I saw this dress, I immediately fell in love with it. As stated by Karl Lagerfeld, “One is never overdressed or underdressed in a Little Black Dress”. My style has evolved over the past year, and as much as I still love love love my patterns and prints, I find myself gravitating towards simpler, more minimalistic pieces to create that effortless, chic, put-together look. The storyboard below is how I styled the dress. Hope you like it! I thought the dress was quite fun and flirty with a retro feel to it. It’s quite a statement piece as seen from it’s cut and the detailed neckline and white detail at the waist. I chose add pops of colour to the outfit by adding the Every Now & Gem necklace and the Retro Rosie Bracelet in Mint. To add more modern details, I chose to add the Betsey Johnson Bling Outside The Box Clutch, the V to Success knuckle ring, the Olivia Burton watch (I’m a watch person) and finished the look off with a pair of black court shoes (also Betsey Johnson) with a scalloped detail. This outfit is perfect for both work and play. It makes you look so put together and the pops of colour make the outfit stand out even more. I’d definitely wear this dress to a party or for an evening out for dinner and drinks or even date night. The dress can be worn in so many different ways, as with various other beautiful dresses that can be found on the site (click HERE and thank me later)!